How to use Streams to organize multiple pipelines. Useful for splitting up proposals, contracts, statements of work, reports, etc. Streams is a cool Proposify feature that organizes types of sales documents, like SOW’s and signed contracts, separately from your proposals. That way your pipeline stays clean with only revenue-related proposals, so you always have a more accurate picture of your sales numbers. You might have two documents you need to send to a client to close a deal. A proposal or presentation/pitch deck that the client verbally approves (or in Proposify just clicks “Accept” no signature needed), and then a more contract-looking statement of work, that includes a signature. Think of it as a five-drawer filing cabinet for your pipeline. Want to separate signed contracts from your proposal revenue? Create a new stream to keep your contracts all in one place. Simply click and drag proposals into your Stream tab for ultra-fast organizing! Streams gives you control over how you organize your pipeline, more accurate metrics, and a clearer picture of your sales. 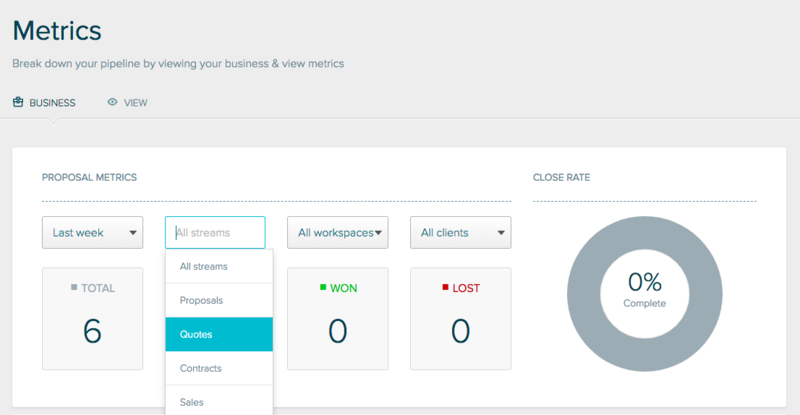 You can also filter your metrics by Stream, giving you a more accurate snapshot of what’s on the go. With each of your integrations, you can choose which Streams will automatically create a new deal or opportunity when a new document is added to that Stream. Proposals without fee tables will no longer be counted in the pipeline proposal value. Previously, if you had a non-revenue document in your pipeline like a contract or a statement of work, its zero dollar amount skewed sales numbers. Now, only your proposals with fee tables will show a value in your sales pipeline so you get a more accurate picture of projected revenue. While Streams is included on all current plans, it's not included on older plans we no longer offer. It’s no problem to stay with that plan, but if you want to use Streams you'll need to choose from one of our current four pricing plans starting at just $25/month. Each of these templates is 100% customizable, so while we’ve included some sample copy to get you started, you can easily change the text to suit your own business, projects, and client requirements.